"Grizzly Bear Mantelpiece" 1954, by Haida artist Bill Reid. The origins of the Government House Art Collection can be traced to a community initiative following the rebuilding of the House after the disastrous fire of 1957. Then Lieutenant Governor Frank Mackenzie Ross initiated the collection with a number of fine antique furnishings acquired in the United Kingdom. Ross also commissioned a series of portraits of previous Lieutenant Governors for the main hall. The practice of commissioning portraits of office holders has continued to the present day. Other major founding donations included a series of historic water-colour British Columbia landscapes by Thomas Fripp presented by H. R. MacMillan, a collection expanded to include other 19th artists such as F. M. Bell-Smith, Thomas Mower Martin R.C.A. and S.A. Clements from donors such as Harold S. and the Directors of the Canadian Imperial Bank of Commerce. A water-colour by an earlier Lieutentant Governor, Sir Henry Joly de Lotbineire, was donated by his grandson. Another major initial donation, by the Canadian National Railways, was the series of large oil landscapes by G. Horne Russell R.CA. These were produced in the first decade of the 19th Century, commissioned for a series of new hotels planned by the Grand Trunk Pacific Railway. The paintings were retrieved from storage as the ambitious building project died with the outbreak of World War I. Over the years major contributions have built a significant decorative arts collection. Hon. Frank Ross and wife gave a magnificent pair of 19th C. Sevres urns. Another highlight of the extensive antique porcelain collection is the late 19th C. Royal Worcestor Eastlake dinner service, with its unique markings to assist the original owner’s colonial servants set the places correctly. The donor was Prof. Sidney Jackman. A small but very fine costume collection has been developed out of the ceremonial uniforms of past Lieutenant Governors, but also period evening wear assembled with the help of the Canadiana Costume Museum and Archives of BC. This collection can be seen on exhibition in the Carey Mews costume museum. Recently major pieces have been commissioned for the house. Carol Sabiston produced a series of backdrop banners that are now the focal point of the ballroom. Two major monumental totem poles were completed, “Hosaqami” in honour of Chief Mungo Martin Kwakwaka’wakw Chief Tony Hunt and the “Healing Pole” by Coast Salish artist, Luke Marston. 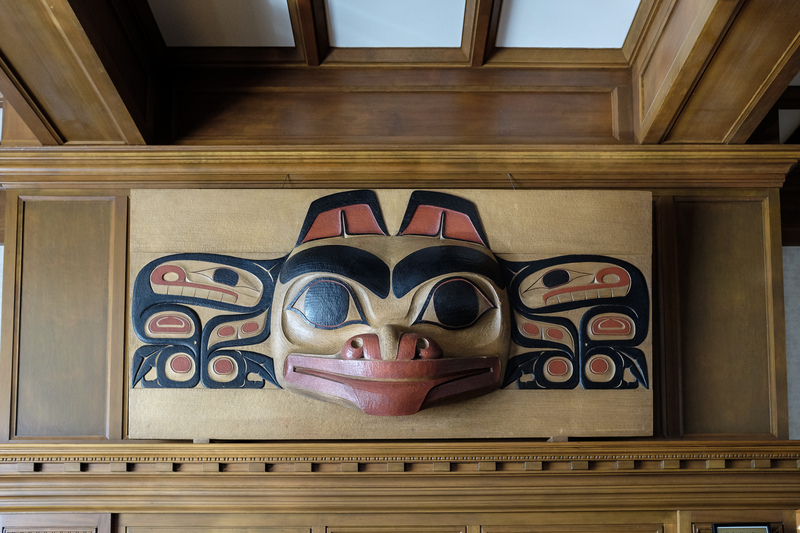 The Government House Art Collection is supplemented throughout the house with temporary loans of fine and decorative arts from the British Columbia Arts Council, the Art Gallery of Greater Victoria, the Legacy Art Collections of the University of Victoria, and individual artists.